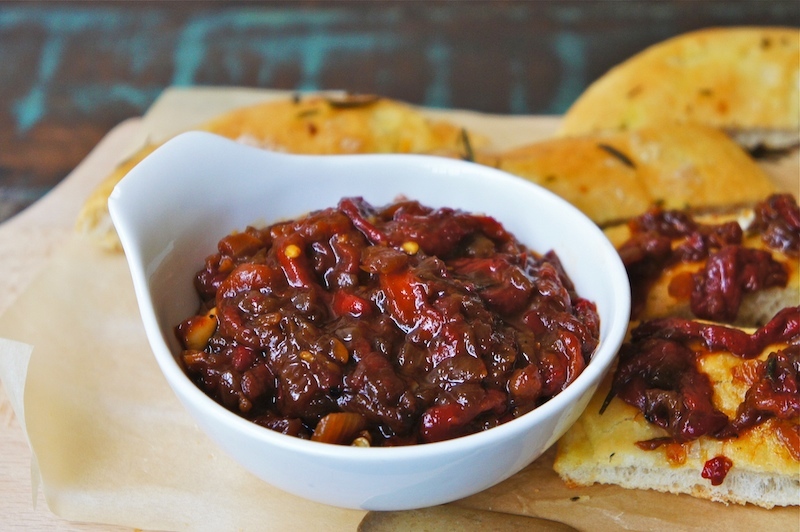 This homemade Roasted Red Pepper Relish is simply delicious. Besides being a fantastic sandwich spread, it also makes a great dip for chips, bread, etc. Made with roasted red pepper, red onion, garlic, and flavored with a bit of sugar, salt, pepper, and balsamic vinegar. That's it! Roasting Fresh Peppers (Broiler): Line a large baking pan with aluminum foil. Place the whole peppers on the foil and brush lightly with olive oil. Broil, turning as needed, until blackened on all sides. Once they are charred, place all the peppers in a large bowl and cover with plastic wrap. Leave it for about 5 minutes, scrape of the skin with a knife or your hand. Remove the top, seeds, cut away the membranes, and julienne the peppers. Reserved 3 to 4 Tbsp juices in the bottom of the bowl. Heat the olive oil in a sauté pan; cook the onions until soft and translucent. Then mix in the garlic and cook for another minute until fragrant, sticky and lightly golden in color. Then add the roasted peppers and continue to cook for about 2 to 3 minutes. Add the reserved liquid, balsamic vinegar, sugar, paprika, and black pepper into the mixture. Bring it to the boil and simmer for about 15 to 20 minutes and season with sea salt, if necessary. That looks like it would be very hard to resist! What a delightful relish! I have to try it, it sounds too good to miss. *just a note - you haven't added how much sugar the recipe requires. That looks great, I like the balsamic vinegar - nice touch!